This weekend all across the country people are going to get up in front of their churches and talk about upcoming events and opportunities to connect with community. They want to move their people to action but in reality a large portion of the room will simply tune out for that part of the service and then tune back in when something more interesting comes along. You know it’s true … because you’ve done it! What’s in it for them? // We want to get them to attend our event. We need volunteers for the upcoming thing. We have a need that we are hoping they will fill. We focus too much on what’s in it for us … but people are intrinsically motivated to pay attention to things that will positively impact them. Frame your announcements in a way that shows how what you are talking about is going to make a difference to them. Too Much Insider Language. // Why do church leaders love cute names for programs and acronyms? These are surefire way to alienate your audience because they need a dictionary to understand what all the different “special names” are for the events and programs at your church. Work hard to ensure that you use plain language that everyone can understand. You need to sell not market. // Marketing is about making sure that people understand about the features and benefits of your product or service. Sales is about working with people individually to overcome their objections and get them to sign on the dotted line. Church leaders think way too much about “marketing” to people when what you need to do is think about “selling”. Who is person that is going to talk to people directly about engaging with your church? No Heart. // Do you feel like yawning while you’re doing the announcements? Imagine what your people are thinking! If you don’t connect your message with their heart every once and while they will stop listening. People want to know why you are passionate about what you are talking about. Move beyond dates, times and locations to the big “why” behind what you are talking about that moves you emotionally. Too much noise. // You want your people to take away the teaching points from the message . . . to chew on what difference that will make in their lives for the coming week. Everything can just be noise. Every time you add another announcement you add exponentially reduces it’s effectiveness in breaking through. Two announcements are 30% as effective as one … three is 90% less effective as one. 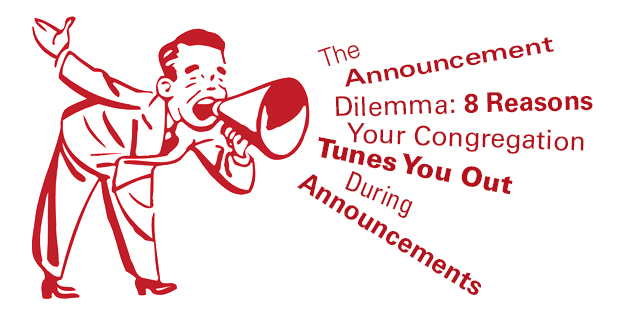 How are you ensuring that you are doing the minimal number of announcements possible to ensure maximum impact? Bad News Bill // Is it always the same person from the finance team that gets up once a month to tell the church how much they are behind on offering? People will learn to tune out that messaging quickly. If you are always the barer of bad news … people will stop listening. Don’t “candy coat” everything … but avoid using the public stage as the place to disseminate bad news. Wrong Audience. // If you are announcing the up coming hiker club trip to the wilderness on Tuesday afternoon . . . which maybe 2% of the audience could possibly attend . . . you are telling 98% of the audience to ignore you. By having announcements that only focus a small part of your community your are training your people to tune you out. If your announcement doesn’t impact 50% or more of the people in the room … why are you talking about it? Too Much Treadmill. // When was the last time you celebrated something fun that happened at your church? If you are always taking time to market what’s coming up next you are missing an opportunity to engage (and reward) people who have been involved in something already at the church. Celebrate your people and what they are doing . . . they’ll listen more. >> Read more from Rich.